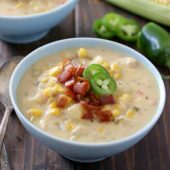 Easy and flavorful slow cooker chicken and corn chowder with a spicy kick! A comforting meal for any night of the week! To the bowl of a 5-6 quart slow cooker, add vegetables, seasonings, chicken, chicken broth and bay leaves. Cover and cook on high for 4 hours or on low for 8 hours. When the intial cook time is up, remove and discard bay leaves. Remove chicken breast, shred or chop into desired sizes and set aside. Whisk cornstarch into heavy cream until smooth. Pour heavy cream mixture into slow cooker, stir to combine. Return chicken to slow cooker, stir gently to disperse. Replace the cover and continue to cook on high for an additional 30-40 minutes. Serve warm with bacon crumbles and jalapeño slices.